Foreign-funded firm Vietnam Fortress Tools JSC is joining other companies of its kind on the local stock exchanges, leveraging the growth of Vietnam’s capital market and possibly leading a new trend of foreign-invested firms going public in the near future. A total volume of more than 26.8 million shares of Vietnam Fortress Tools (Fortress), at par value of VND10,000 ($0.44) a share, is going to be listed on the Hanoi Stock Exchange (HNX) in May. According to Vi Nguyet Cam, Fortress investor relations manager and head of the supervisory board, Fortress expects its shares to start off at VND40,000 to VND60,000 ($1.78-2.67) a piece. The company’s earnings per share (EPS) for 2017 sit at VND3,602 ($0.16), while earnings per share (EPS) for 2018 is forecast at VND5,945 ($0.26). The price-to-earnings ratio (P/E) stands at 6.94 for 2017 and is estimated at 6.73 for this year. A P/E of 6.73 is considerably more attractive than the average P/E of the local stock market, which sat at 20 last week. While it has been observed that other foreign-invested enterprises (FIEs) have not done so well following their initial public offering (IPO), things for Fortress could not be better ahead of its debut on HNX. Marc Djandji, head of institutional sales at Rong Viet Securities (VDSC), said that Everpia, for instance, went public at probably one of the worst times for Vietnam, in 2010, “when the market was going nowhere and liquidity was bad”. “When a company makes its IPO, whether it’s an FIE or not, going public with the right market conditions makes a big difference,” noted Djandji. “The market right now is much better for an IPO. “We’re seeing a situation where more and more private companies are deciding to list. They’re seeing the opportunities that the market offers,” he told VIR. Thus, the timing for Fortress to get listed in May is great, he stressed. Fortress was originally set up in 2006 under the name Formosa Tools – a 100-per-cent foreign-owned gardening tools manufacturer. It is a member of Taiwanese-backed Formosa Tools Co., which holds 30.55 per cent of its chartered capital. Apart from Formosa Tools, Fortress’s major shareholders include Emblem Holding (18.34 per cent), Probus Opportunities (9.33 per cent), and VN Alpha Limited (7.37 per cent). 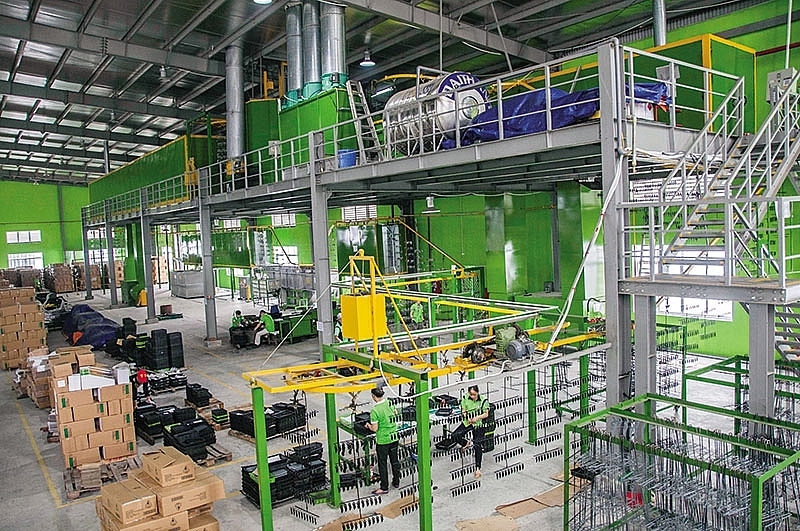 Thanks to the rapid growth of the manufacturing sector, Fortress’s sales have been on the rise over recent years, with about VND459 billion ($20.4 million) in revenue recorded in 2016, with the number reaching VND546 billion ($24.27 million) in 2017 and estimated at VND1.4 trillion ($60.8 million) for 2018. Pre-tax profit for 2017 grew some 175 per cent from 2016, from VND25 billion ($1.11 million) to VND68 billion ($3.02 million). Fortress switched from a limited liability company to a joint stock company in 2016 and changed its name from Formosa Tools to Fortress Tools. Through private placements, the company raised its chartered capital to VND268.07 billion ($11.91 million) by the end of 2017. Lidl Hong Kong, as per Cam’s account, is Fortress’s strategic partner in Vietnam, and Lidl as one of the largest global retailers will back Fortress with its financial planning, credit line, material sourcing, and sales orders. She also told VIR that Fortress has an ambition to become a lucrative listed FIE on the local stock exchanges, paving a new trend for other FIEs in Vietnam. The company, meanwhile, said that it is fully aware of other listed FIEs like Everpia or Taicera, which saw share prices falling following their listing, causing concerns over a divestment spell among foreign investors. “Fortress stands apart from this trend, as we will expand production and grow swiftly in the near future,” noted Cam. “Fortress currently operates as the main production hub for Formosa Tools, so we don’t have a plan for divestment. “Rather, Formosa Tools and the Hsu family, the founders of Formosa and Fortress Tools, will invest more to enhance local capacity, with the percentage of holdings to be just over 50 per cent, while leaving the rest for other investors. We want to attract small and individual investors in Vietnam through our listing to enhance our share liquidity and to boost our brand recognition,” she added.